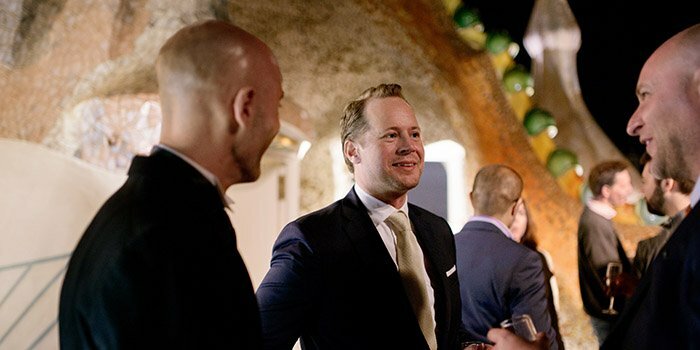 The Swedish entrepreneurs Kevin Freij and Jonas Borgh were the winners of the AirBnb initiative, the company of apartment vacation rentals launched, last February a contest in which the winner would be living for two days at the Gaudi’s architectonic jewel in Barcelona’s passeig de Gràcia. The house was furnished with the modernist style for this special occasion, and its guest that visited Barcelona for the Mobile World Congress (MWC), received this prize after presenting the most innovative idea on mobile technology that could be applied to Casa Batlló. Thus Kevin Freij founder of MYMobile Security and Jonas Borgh proposed an augmented reality platform to offer a more complete experience to the Casa Batlló visitors, this idea awarded them the 1st Prize. During these days, the house has regained its original epoch style thanks to the art director’s Iñigo Navarro incredible work, who has taken part in movies such as, “Vicky, Cristina, Barcelona” (Woody Allen), “Haywire” (Steven Soderbergh) or “Kingdom of Heaven” (Ridley Scott).